Before submitting any screening task, please check the instructions / guidelines of each task. Click submit a screening task here to. 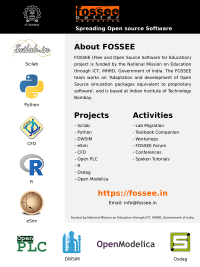 For more updates, please check https://fossee.in/fellowship/2019 and https://fossee.in/fellowship/2019/web-development regularly. Kindly make sure that your submission files do not contain any copyright content. Screening Task 1: Kindly visit this link to view the problem statement and submission guidelines of Screening level task 1. Screening Task 2: Kindly visit this link to view the problem statement and submission guidelines of Screening level task 2. For any queries, write to us at info[at]fossee[dot]in with the subject line as "FOSSEE Fellowship 2019 - Web Development"